The Group Sharing feature allows Dashlane Business users to easily and efficiently share Passwords and Secure Notes. Onboarding employees and ensuring they have the necessary passwords has never been easier. Group Sharing is a feature exclusive to Dashlane Business which allows admins to organize users on a Dashlane Business plan into groups, creating a more secure and efficient sharing experience for your company. Using this feature, admins can create groups based on departments, or your company's specific needs. Then end users (or admins) share items to these groups. By doing so, you create an organized environment for your company's secure information and save time when on-boarding and off-boarding employees. Using Dashlane's sharing feature is secure whereas sharing sensitive data in emails or text messages is not. Sharing information through instant messaging apps is also not secure, as the information is usually not encrypted and is sent in plain text on the network. This means your information could be read by the company running the messaging service, and conversations are also generally saved in the history by these applications. However, by using Dashlane's Sharing feature, your data is encrypted using the best encryption system before even being sent over the Internet. For more information on security and encryption, please click here. To use Group Sharing you must have a Dashlane account and be part of a Dashlane Business plan. Your Dashlane desktop app also must be upgraded to version 4.8.1 or higher. Please note that Group Sharing was designed strictly to work for groups created within your own Dashlane Business plan and not with other Dashlane Business, Premium, or free users. Admins must first create a group, then add users to the groups before they can begin using the feature. To create a group, admins must navigate to the Groups tab within the Admin Console and click the green + New group icon. Next, enter a group name and click OK. If a group already exists, Dashlane will display it here. Note: group names must be unique. To rename a group, click on the group you wish to rename under the Groups tab on the console, then on the next page, click on the group's name again to populate the editing field. Enter a new group name and hit your Enter key. To delete a group, click on that group in the Groups tab within the Admin Console then on the next page, click on Delete Group at the top-right corner of the screen. Enter the name of the group you wish to delete (case sensitive) and click Delete. This is done as a precaution to prevent accidental deletion of groups. Deleted groups cannot be recovered. If a group is accidentally deleted, an admin will have to recreate the group and invite users to the new group. Then users will be able to re-share passwords within the new group. Note: if a group is deleted, only the original password owner will retain the password. To invite group members, locate the Groups tab within the Admin Console and click on the group you wish to invite members to. On the next page, click on the green + Add members icon at the top-right corner of the screen. Enter the email address(es) of the member(s) you would like to invite and click Add. The member(s) will receive an email notification stating to either accept or deny the invitation to the group within the Dashlane app's Sharing Center. Since Admins are not required to be members of all groups, they will need to enter their email address during the member invite process to be added to a group in order to share with it. Note: End users will only receive an email to join a group. Users will not receive additional communications when items are shared with that group. Those will be accepted automatically in the groups and the users' accounts once shared. To view invitation statuses for each group, locate the Groups tab within the Admin Console and click on the group you wish to view. On the next page, the email addresses of all group members will be displayed along with the status of the invite or the role of the user within the plan displayed to the right, once they accepted the invitation. When a group invite has not been accepted or declined, it will be listed as Pending. Once the member accepts, the member will be listed as Member or Admin. Note that these are the roles within the plan and NOT within the group. If the group member declines the invite, they will be removed from the group. Any group member acceptance or decline will prompt an email to the plan's Admin. If you need to re-invite a member in case they did not receive the invitation, locate the member from the list, click on the trash can icon, and click on Remove user. Next, add the member again by clicking on the green + Add members icon at the top-right corner of the screen and entering their email address. 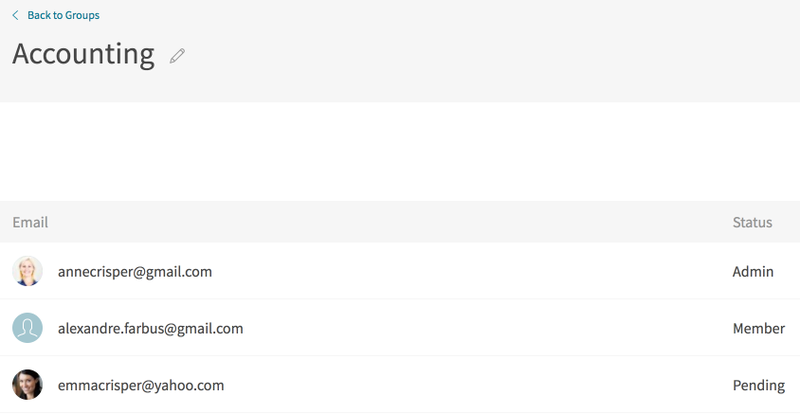 If users are having trouble receiving emails from Dashlane, please add the domain "dashlane.com" to your email whitelist. To revoke group members from a group, locate the Groups tab within the Admin Console and click on the group you wish to view. On the next page, locate the member from the list and click on the trash can icon. To confirm, click on Remove user. Once your user groups are all set up, you can start sharing items within groups, which can be done by group members and admins alike from the Dashlane application. Please refer to this article for more information.